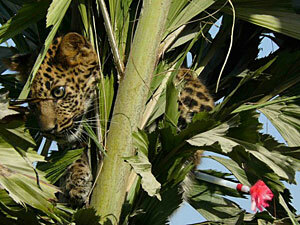 SNOOZE: The leopard cub that had climbed up a tree at a residence in Dhapasi last year gets a dart in its flank. The leopard mother and cub had wandered into the garden of a house in Dhapasi one morning last year. Locals raised the alarm, and the cornered mother was shot dead when it tried to break out. 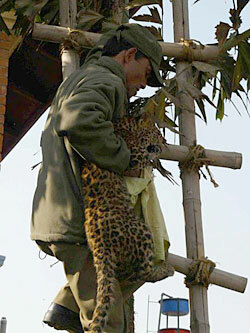 The cub was finally darted and caught, later set free in Shivapuri National Park. Man-leopard encounters have become increasingly common in Kathmandu and across Nepal as the success of community forests has led to a revival of wild animals, which enter inhabited areas in search of easy livestock prey. who lose goats or chicken, or for the leopard. In Kathmandu, the Central Zoo has a darting team, but they usually arrive at the scene too late because systems aren't in place for quick deployment. "There hadn't been a clear mechanism for a rapid response team," admits Sarita Jnawali, director of the Central Zoo, "a zoo's actual role is to take care of the animals within it, not capture those in the wild." Since Kathmandu did not have an official wildlife rescue team, the Central Zoo agreed to take up the role. It has now hired an experienced wildlife vet, and a mobile tranquiliser team. Naturalists say that the reason for frequent leopard incursions is paradoxically Nepal's success in protecting its forests. The leopard, being the apex predator makes forays into the outskirts of Kathmandu or into villages when it is driven out due to competition, or due to depleting prey. The problem is that most locals panic when they see a leopard, and think it is a man-eating tiger. Shanta Raj Jnawali at the National Trust of Nature Conservation says this spooks the leopard which then tries to defend itself. Leopards generally avoid people, and don't bother them if they aren't disturbed. But hungry leopards have been known to attack children if they are old or injured and can't hunt traditional prey. "If you sees a leopard, you should not disturb the animal," advises Jnawali, "walk out of the house, lock it and wait for the rescue team." Rinjin Shrestha at the World Wildlife Fund Nepal advises against separating the cubs from their mothers because she may come back looking for them. However, the leopard is much less well studied than tigers and not a lot is known about their territorial competition and other habits. There has been a study of tiger-leopard confrontations in Bardiya National Park, but there hasn't been much research into encounters with humans. Since it has been thrust by default into the role of rescuing leopards, the zoo has provided a grant to a student from Tribhuvan University to study leopard incursions for his master's thesis. With better knowledge of why leopards are leaving their natural habitat, a reliable rapid response system and better public awareness, leopard encounters in future need not end in tragedy. Has anyone tried radio-collaring the problematic leopards, or have all died in human encounters??? TJ, not all have died in human encounters - 8 or 9 of them who have wandered into the city in the past were tranquilized and brought to the zoo, where their injuries acquired from human beatings were treated. Thence they were restored to the parks. Radio collaring has been done on tigers mostly, and a few leopards in the south of the country that have been studied. 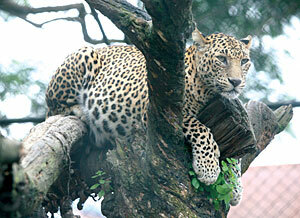 The problem is that the leopards that come to Kathmandu (lies in the mid regions of Nepal) have not been studied. They've been visiting us quite often.